JACKSON HOLE, WY – In January 2017, Connor Nolan was caught in an avalanche while traversing from Gothic Couloir on Cody Peak back to Teton Village. Nolan, 23, had accomplished a goal that tops many Jackson athletes’ lists. He skied the 20-foot cliff that is part of Jackson’s iconic “Trifecta,” along with Central and Breakneck Couloirs. The 2016-17 winter was the valley’s biggest in decades. The avalanche danger was high, the conditions questionable. It had been snowing nonstop for a week. The run didn’t go as planned—he crashed, hard. But he made it to the bottom of the couloir, he’d done it. Relieved and exhilarated, he began the traverse out. His ski partners followed. There was no skiing out of this slide. Nolan pulled the airbag from his avalanche pack as he tumbled, trying to swim toward air. For a long minute, he plummeted down the face, eventually hitting a tree with his entire right side, amassing significant body and brain injuries. “At that moment, I was certain I was going to die,” he said. When the snow settled, Ryan couldn’t see anything. He began skiing down, and was surprised to find Nolan alive. Ryan and the others delayed calling Teton County Search and Rescue (SAR), debating the money and pride that might be lost in making the call. Meanwhile, it became increasingly clear that Nolan was in serious danger. It was near dark by the time they called for a rescue and Nolan was hypothermic and coughing blood. For two and a half hours, they waited on the exposed face, knowing the rest could slide any second. Nolan was in a shock loop, repeating the same sentences to his ski partners every 10 minutes, not sure where he was, shaking uncontrollably. When the helicopter arrived, with only minutes of flying time left in the day, there was no way for pilot Nicole Ludwig to land it on the first attempt. Nolan remembers watching the helicopter fly away with “sinking dread,” wondering if he’d die on the mountainside. Eventually, Ludwig landed the chopper. SAR team members AJ Wheeler and Cody Lockhart got to work—Nolan remembers them putting things up his nose and in his throat, putting him in a stuff bag. “Everybody was in danger at that point,” Nolan said. They quickly extricated Nolan and the others were left to ski down. After safely flying Nolan to a waiting ambulance, Ludwig flew to SAR’s headquarters, racing against the setting sun. Once in the ambulance, Nolan was still hypothermic, still “concerned about continuing to live.” He was freezing cold, and someone placed a warm blanket on him. It felt amazing. He remembers nurses asking to cut his clothes off, he remembers not wanting to call his parents, he remembers texting his boss to say he wouldn’t be making it to work. Nolan ’s parents flew from New Hampshire to be with him as he transitioned from the intensive care unit to the progressive care unit to St. John’s Hitching Post. A few weeks later, Nolan and his parents got on a flight back to New Hampshire where he would recover. Nolan left town with a shattered right pelvis, a punctured lung, 11 broken ribs, a brain injury and significant trauma. The avalanche may have lasted less than a minute, but the event is emblematic of the unseen forces at work in Jackson. Nolan’s experience typifies the town’s risk-taking culture, for which he now has much less tolerance. It also brings to light other questions—what is the ripple effect of one person’s decision? Who, beyond the victim, is impacted? How do we heal from trauma as individuals and as a community? Connor Nolan once chased a culture of extreme that has become commonplace among Teton skiers. January 12 was the day everything changed for Nolan, but it wasn’t the first time he’d been in a high-risk situation. In fact, he’d spent three years in Jackson pushing the boundaries. That’s what everyone seemed to be doing. His group of friends were strong skiers and informed backcountry users. They constantly communicated about snowpack and routes. However, their focus was “mission, mission, mission.” Each mission built on the last. The week before Gothic, Nolan had skied S&S, one of the most technical and consequential couloirs in the area. The drop can be up to 40 feet, missing the landing means slamming into a wall. But he’d done it. There was no going back, only forward. “I was always building. If I ski this, it means I can ski that, and keep going up the ladder of pro-skiing,” Nolan said. For Nolan, there was the internal athletic drive, the pressure of being a young man proving himself in an extreme town, and the ubiquity of social media.“There’s always pressure to be posting cool photos and videos of skiing,” he said. In Backcountry Zero’s podcast, Ryan said it was their goal to ski the best lines better than others had before them, and to film it all. Jenn Sparks, a veteran SAR volunteer and Jackson resident, agreed that what is considered “normal” has changed drastically in the nearly 30 years since she’s been here. She took her fair share of young, naive risk—rowing the river in a duckie without a life jacket—but back then, a day of skiing that ended with a hamburger was considered a full day. Now, that level is incredibly high. Everyone feels they have to do The Trifecta, for example, but these runs aren’t static—they’re different every year due to changes in snowfall, temperature, wind and moisture. “Just because these things have been skied doesn’t mean they’re skiable,” Nolan said. The people who pioneered the lines that Nolan and his friends aspired to, those who shifted what was considered possible, are valorized. And some are now dead. This was Nolan’s biggest lesson from the avalanche: “It’s not worth skiing to lose your life,” or to risk other people’s. He has recovered after many months at home with physical therapy. His life has changed, though. He has a different relationship with skiing, the thing he loves the most in the world. Last year, he was in the backcountry every day. This year, he went out three times. One of Nolan’s rescuers, who was also interviewed in “The Fine Line” podcast, knows what Nolan went through. He understands the drive to push farther and faster, and he knows what it feels like to get a serious wakeup call, or a few. Cody Lockhart grew up in Jackson and has been skiing his entire life. One of SAR’s 37 volunteers, he joined the team in 2009 when he was 23 because it seemed cool, another way to spend more time in the mountains. Lockhart spent his early 20s skiing everything he could. “It was my extremely young and dumb phase,” he said. Like Nolan, he idealized the great skiers who had come before him: “We have this Viking culture where you go die in the mountains and it’s a noble death.” His icons died not with their sword but their skis. “We have normalized it,” he said. Being a first responder takes a tremendous mental toll. According to the National Center for PTSD, rescue workers of all kinds often suffer from mental health issues. A 2018 study found that depression affects up to 53 percent of first responders. About 34 percent suffer from PTSD. Just this month, PTSD expert Tania Glenn visited from Austin, Texas, to talk to first responders, including SAR volunteers, about mental health. One of the biggest obstacles first responders face, Glenn told PJH, is that they worry about being pulled off the job if they ask for help. But asking for help is necessary, especially because trauma can accumulate in unanticipated ways, and responders need to be able to realize when they’ve reached a breaking point. Trauma is an unavoidable part of their job, even when rescues go well. It is one of the unseen side-effects of Jackson’s extreme culture. It is not just victims of avalanches who are impacted, but their families, their rescuers, and their rescuers’ families. One disaster has invisible ripples through the entire community. SAR volunteers average 70 to 100 rescues a year, and respond to an average of three to four fatalities. They are always on call. The impact of a disaster starts before it even happens. Every time the phone rings, volunteers’ blood pressure rises, their hearts beat faster. “We go from zero to 100,” Lockhart said. “You pick up from wherever you are in your life and go into an intense scene.” Then they have to come back down, return to work, go home to their families. First responders experience the stress response most of the time, which elevates into full-blown survival mode during every call: “It’s very taxing for the brain and body,” Glenn said. “And then they have the adrenaline dump after, the body is trying to recover,” but they don’t always have time to recalibrate before the next rescue. All of this ages a person and has a widespread effect: “The ripple effect is quite large … When a first responder is exposed to trauma, the stress and their reaction to it goes straight to their house. It’s very common for loved ones of first responders to have vicarious trauma. They’ll take on a lot of the same symptoms,” Glenn said. Scott Guenther, the Jenny Lake District Ranger, has plenty of experience with the flight and fight cycle. He coordinates Grand Teton National Park’s 70 average rescues per year, sometimes with the help of SAR volunteers. He is most impacted by winter rescues. When the phone rings in the winter, he can be relatively sure of two things: the person in trouble is a local, and he knows them or knows of them. After 27 years of working in the park, and his own fair share of risky adventures, he knows the valley’s skiers, and where they’re likely to get in trouble. 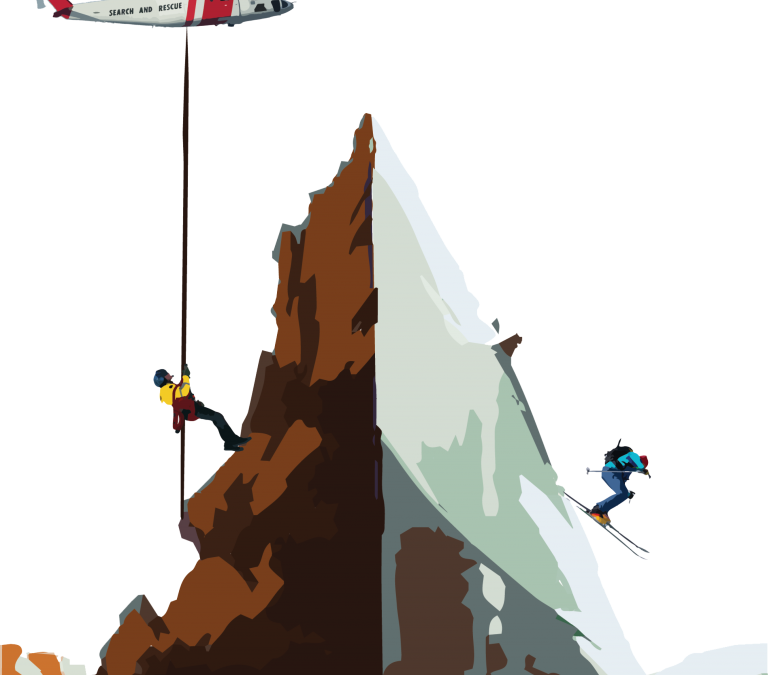 Winter rescues are technical, and first responders are as vulnerable to avalanches, cold, and waning daylight as their patients. After saving a life or bringing home a body, the work continues. Loved ones also feel the stress. When the weather is bad in the mountains and a rescuer gets a call, family members know their son, daughter, wife, husband, mother, or father will be risking their own lives to save another. Guenther has responded to friends’ fatal accidents. He’s had to tell wives and brothers that their loved one is dead. It adds up. There are the memories, like “that smell is stuck in my nose, this sight is stuck in my head,” and then the enduring, difficult work of being there for victims’ families. The team struggled to cope with the grief that still impacts them. Many SAR volunteers and Jenny Lake rangers have been with their organizations for years, and the trauma of loss, within their ranks and without, can accumulate. Because of this slow accumulation, Guenther said staying vigilant is critical. That means monitoring personnel very closely. “It’s insidious how trauma can affect you and your professional life and your judgement, how it affects your home life.” Guenther pointed to at least one Jenny Lake ranger who left his post because of traumatic experiences on the job. Jake Urban, president and owner of the Jackson Hole Leadership Institute, has also been a SAR volunteer since 2010. For the first time, he is taking a break, partially because of the cumulative stress and trauma. Urban said outdoor leadership training and education is his calling. All of his work, he said, brought him to this day. Indeed, being outside, teaching people to be safe outside, and rescuing those in trouble is his entire life. The strain of his entire life revolving around one thing has affected Urban. Therefore, the entire community has a part in holding buckets together. “As a community, we’re all interconnected.” If a volunteer is struggling at work, with their family, or friends, they may start to feel the impact of rescues more. Unlike many others who have found themselves in similar situations, Nolan is both alive to tell his story and willing to acknowledge the mistakes he and his friends made. A light was shone on this culture on April 22, when a 24-year-old man died when his snowmobile was caught in an avalanche. Some media outlets reported neither he nor anyone in his party had any avalanche gear. In addition, there are plenty of locals who go out in the backcountry not fully understanding how their transceiver works, Sparks said. Shaming or judging will not increase their responsibility or accountability. What will change is if people start to come forward and say what they should have done differently. That’s what SAR does after each rescue, and it’s what every outdoor athlete should do, Sparks said. Nolan did not experience any shaming. He’s felt supported, people are simply happy he is all right. Today, he has completely changed his relationship to skiing and taken leave of bucket list culture. “I’m getting back to the basics,” he said. In the race to be extreme, Nolan says people forget to have fun. Now, his goals are to have fun, to push himself while skiing—mostly inbounds, for now—and to take responsibility for his actions. The helicopter that made Connor Nolan’s rescue possible has become critical to SAR rescues, especially as an increasing number of athletes venture into more extreme terrain during more months of the year. SAR has access to a helicopter six months of the year, but it is trying to up its access to seven months. SAR’s “Heli-yes” campaign is attempting to raise $60,000 by May 19 to cover the cost of the extra month. The helicopter, even when not used, costs a minimum of $32,000 per year. Eventually, SAR hopes to have access all year long.